Some projects just go wrong. It’s a fact of life. Projects go over budget, blow their schedules, squander their resources. Sometimes they go off the rails so spectacularly that there’s nothing you can do except (literally) pick up the pieces and try to learn whatever lessons you can so you don’t repeat the failure in the future. Last week I got a phone call from a developer who was looking for some advice about exactly that. He’s being brought in to repair the damage from a disastrous software project. Apparently the project completely failed to deliver. I wasn’t 100% clear on the details—neither was he, since he’s just being brought in now—but it sounded like the final product was so utterly unusable that the company was simply scrapping the whole thing and starting over. This particular developer knows a lot about project management, and even teaches a project management course for other developers in his company. He’d heard me do a talk about project failure, and wanted to know if I had any advice, and maybe a postmortem report template or a lessons learned template. I definitely had some advice for him, and I wanted to share it with you. Postmortem reports (reports you put together at the end of the project after taking stock of what went right and wrong) are an enormously valuable tool for any software team. But first, let’s take a minute to talk about a bridge in the Pacific Northwest. One of my favorite failed project case studies is Galloping Gertie, which was the nickname that nearby residents gave to the Tacoma Narrows Bridge. Jenny and I talk about it in our “Why Projects Fail” talk because it’s a great project failure example—and not just because it failed so spectacularly. It’s because the root causes for this particular project failure should sound really familiar to a lot of project managers, and especially to people who build software. While there were no human casualties, despite heroic attempts at a rescue the bridge disaster claimed the life of a cocker spaniel named Tubby. But one of the most important lessons we took away from the bridge collapse isn’t technical. It has to do with the designer. [A]ccording to Eldridge, “eastern consulting engineers” petitioned the PWA and the Reconstruction Finance Corporation (RFC) to build the bridge for less, about which Eldridge meant the renowned New York bridge engineer Leon Moisseiff, designer and consultant engineer of the Golden Gate Bridge. Moisseiff proposed shallower supports—girders 8 feet (2.4 m) deep. His approach meant a slimmer, more elegant design and reduced construction costs compared to the Highway Department design. Moisseiff’s design won out, inasmuch as the other proposal was considered to be too expensive. On June 23, 1938, the PWA approved nearly $6 million for the Tacoma Narrows Bridge. Another $1.6 million was to be collected from tolls to cover the total $8 million cost. Think back over your own career for a minute. Have you ever seen someone making a stupid, possibly even disastrous decision? Did you warn people around you about it until you were blue in the face, only to be ignored? Did your warnings turn out to be exactly true? Well, from what I’ve read, that’s exactly what happened to Galloping Gertie. There was plenty of warning from many people in the civil engineering community who didn’t think this design would work. But these warnings were dismissed. After all, this was designed by the guy who designed the Golden Gate Bridge! With credentials like that, how could he possibly be wrong? And who are you, without those credentials, to question him? The pointy-haired bosses and bean counters won out. Predictably, their victory was temporary. Incidentally, some people refer to this as one kind of halo effect: a person’s past accomplishments give others undue confidence in his performance at a different job, whether or not he’s actually doing it well. It’s a nasty little problem, and it’s a really common root cause of project failure, especially on software projects. I’ve lost count of the number of times I’ve encountered really terrible source code written by a programmer who’s been referred to by his coworkers as a “superstar.” Every time it happens, I think of the Tacoma Narrows Bridge. But there’s a bigger lesson to learn from the disaster. When you look at the various root causes—problematic design, cocky designer, improper materials—one thing is pretty clear. 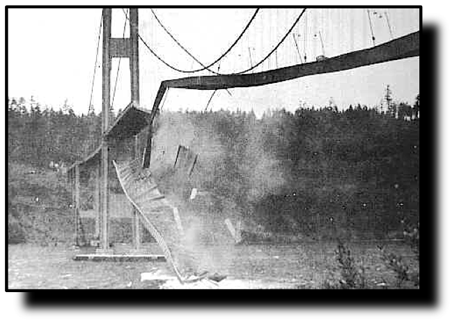 The Tacoma Narrows Bridge was a failure before the first yard of concrete was poured. Failure was designed into the blueprints and materials, and even the most perfect construction would fail if it used them. If you want to gain valuable experience from investigating a project—especially a failed one—it’s really important that you write down the lessons you learned from it. That shouldn’t be a surprise. If you want to do better software project planning tomorrow, you need to document your lessons learned today. You can think of a postmortem report as a kind of “lessons learned report” that helps you document exactly what happened on the project so you can avoid making the same missteps in the future. So how do we take stock of a project that went wrong? How do we find root causes? How do we come up with ways to prevent this kind of problem in the future? The first step is talking to your stakeholders… all of them. As many as you can find. You need to find everyone who was affected by the project, anyone who may have an informed opinion, and figure out what they know. This can be a surprisingly difficult thing to do, especially when you’re looking back at your own project. If people were unhappy (and people often are, even when the final product was nearly perfect), they’ll give you an earful. This makes your life more difficult, because it’s hard to be objective when someone’s leveling criticisms at you (especially if they’re right!). But if you want to get the best information, it’s really important not to get defensive. You never know who will give you really valuable feedback until you ask them, and it often comes from the most unexpected places. As developers, we have a habit of dismissing users and business people because they don’t understand all of the technical details of the work we do. But you might be surprised at how much your users actually understand about what went wrong—and even if they don’t, you’ll often find that listening to them today can help make them more friendly and willing to listen to you in the future. Were the tasks divided well among the team? Were the right people assigned to each task? Was each work product useful in the later phases of the project? Did the software meet the needs described in the vision and scope document? 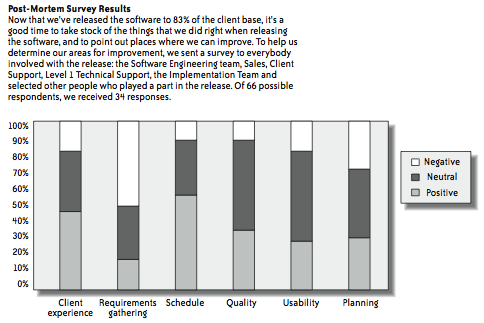 Did the stakeholders and users have enough input into the software? Were there too many changes? How complete is each feature? How useful is each feature? Have the users received the software? How is the user experience with the software? Are there usability or performance issues? Are there problems installing or configuring the software? Were the initial deadlines set for the project reasonable? How well was the overall project planned? 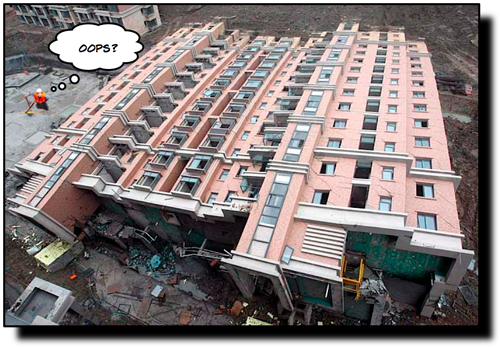 Were there risks that could have been foreseen but were not planned for? Was the software produced in a timely manner? Was the software of sufficient quality? Do you have any suggestions for how we can improve for our next project? Was the beta test effective in heading off problems before clients found them? All of the comments we got about the beta were negative, and only 26% (9 of 34) of the survey respondents felt that the beta exceeded their expectations. The general perception was that many obvious defects were not caught in the beta. Suggestions for improvement included lengthening the beta, expanding it to more client sites, and ensuring that the software was used as if it were in production. I feel like Versions 2.0 and 2.1 could have been in the beta field longer so that we might have discovered the accounting bugs before many of the clients did. We need to have a more in-depth beta test in the future. Had the duration of the beta been longer, we would have caught more problems and headed them off before they became critical situations at the client site. I think that a lot of problems that were encountered were found after the beta, during the actual start of the release. Shortly thereafter, things were ironed out. Overall, the release has gone well. I just feel that we missed something in the beta test, particularly the performance issues we are experiencing in our Denver and Chicago branches. In the future, we can expand the beta to more sites. There’s another approach to coming up with postmortem survey results that I think can be really useful. Jenny and I have spent the last few years learning a lot about the PMBOK® Guide, since that’s what the PMP exam is based on. If you’ve studied for the PMP exam, one thing you learned is that you need to document lessons learned throughout the entire project. The exam takes this really seriously: you’ll actually see a lot of PMP exam questions about lessons learned, and understanding where lessons learned come from is really important for PMP exam preparation. Were there any unexpected changes? How well did we handle them? Did the scope (or schedule, or staff, or our understanding of risks, etc.) look the same at the end of the project as it did at the beginning? If not, why not? If you can get that information from your stakeholders and write it down in a way that’s meaningful and that you can come back to in the future, you’ll be in really good shape to learn the lessons you need to learn from any project. Even a failed one.